The Premiair line-up that beat Feeder FC 3-1: ( back row, left to right) Billy Wright, Ryan Alban, Daniel Irwin, Lewis Payne, Ross MacKinnon, Nico Agius, Rian Innes, Thomas Brown, Chris Ward, Ben Calvo. (front) Liam Hatfield , Andrew Parkin, Aaron Sawyer, Isaac Twigden, Connor Hatfield, Seb Calvo, Jamie Rose, Adrian Eames, Cory Rose. 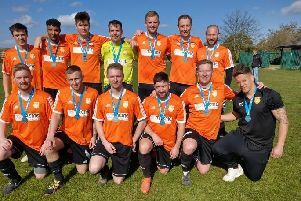 Premiair saw off the challenge of one city rival for the Peterborough League Division Four title last weekend and now they’ve set their sights on another. Premiair beat Feeder FC 3-1 (January 21) thanks to goals from Chris Ward, Thomas Brown and Ryan Alban to move to within a point of leaders Holbeach Bank. Matthew Wilkin replied for Feeder. Action from Premiair's 3-1 won over Feeder FC in Division Four of the Peterborough League. Bank were raided 4-2 by Cardea who are likely to become Premiair’s main rivals for the Division Four crown. “We have five games in hand on Holbeach Bank so we should get past them,” Premiair manager Billy Wright stated. “Feeder are probably out of the running now so that leaves Cardea. We are level on points with them with two games in hand, but we haven’t played them in the league yet. “We lost on penalties to them in the cup so we’re looking forward to getting revenge later in the season. “We had a wobble before Christmas when we lost three games in a row, two of them in the league. Premiair, who won Division Five last season when playing under the Limetree UTR banner, will go top on Saturday if they win at Long Sutton Athletic Reserves and Holbeach Bank fail to beat Stamford Lions A at home. Division Five has split into two divisions for the second half of the season with Peterborough NECI heading the A section with two wins out of two. John Regan (2), Julio Garrido, Andrew Cook and Luke Thackham scored in Saturday’s 5-1 win over Holbeach A.
British School of Sport preserved their 100% record in Division B with a 5-4 win at Wisbech Acorns Under 21s.